The birth of a child brings exciting changes to a household. 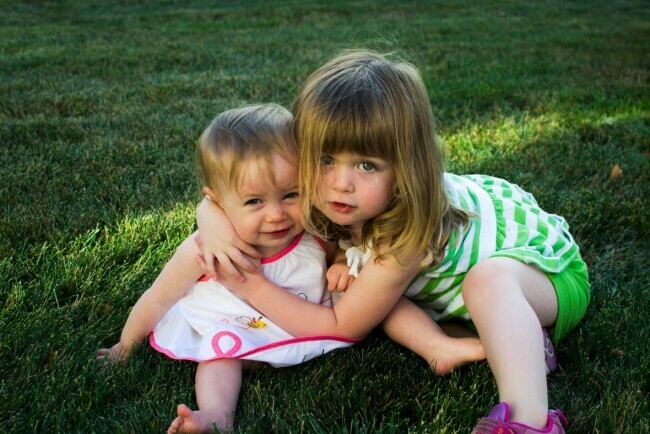 But those changes can also be scary and overwhelming for an older sibling. 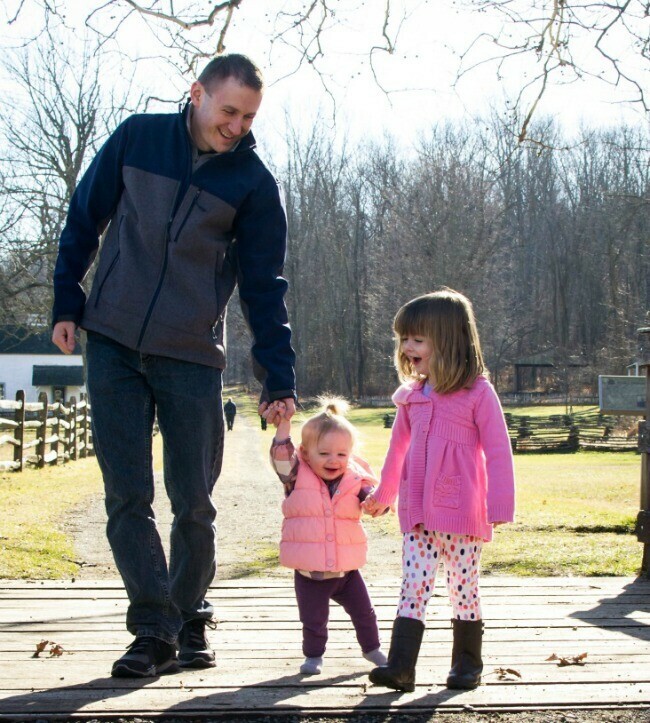 J&J dad Jim shares his experiences in helping his older daughter, Rose, adapt to the arrival of her younger sister. My wife Julie and I are the proud parents of two girls – Rose (3 and ½) and Gabrielle (16 months). 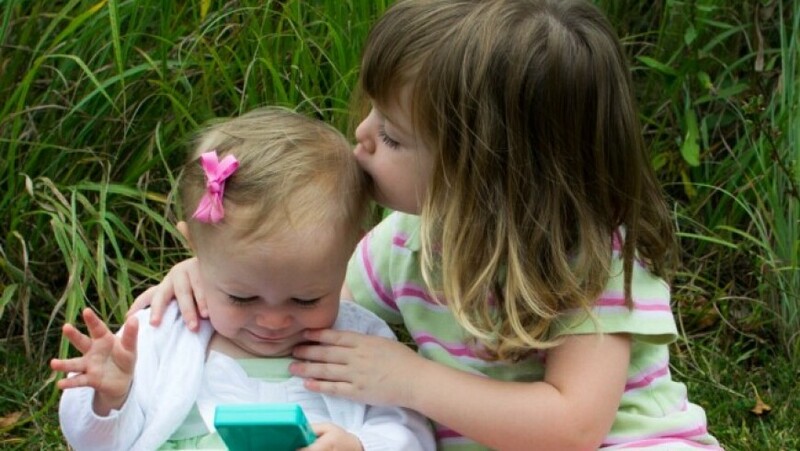 Our whole family has learned a great deal about what it is like for an older child to adjust to a new baby sibling in the house, and how to help her cope with this enormous change. As Gabrielle’s due date was approaching, friends, neighbors and family provided the occasional bit of advice on helping Rose adjust. Many were cute and creative – such as providing Rose her own baby doll to take care of or reading books about new siblings. Neighbors who were raising their second daughter told us that we just had to get through the first four months. They assured us it would be smooth sailing after that. But it wasn’t. Four, five, and even eleven months had passed, and Rose was still struggling with the change. Though there were many happy moments between the two girls, there were also far too many contentious ones – ultimately ending in a predictable post-time-out speech and two children crying. We did some research, and found that it’s often recommended to try to view the transition from the vantage point of the older child. A common analogy that is used is: Imagine your wife comes home with a new husband and says, “Here’s our new husband. He’s going to live with us now. He’s rather needy, so I’m going to need to spend a lot of time with him, OK? Besides my attention, he’s also going to take your possessions, too. But you’re going to be best friends! Now give him a hug and kiss!” We realized that Rose was experiencing a lot of turmoil. What child wouldn’t feel as though their world had just been turned upside down? Rose seemed to prefer negative attention over no attention at all. A surefire way to win some 1:1 time with mommy or daddy was for Rose to misbehave and get put in time out. In our research we noticed an emphasis on using attention – especially 1:1 time – and positive feedback as the main levers to reinforce desired behaviors with Rose. Most importantly, we have made a focused effort to acknowledge Rose’s special and unique talents: “Rose, good job putting your dishes in the sink after dinner! Gabrielle can’t do that.” We also directly ask Rose how her sister is making her feel. And we try to express empathy when she is frustrated by her sister: “I know, Gabrielle needs to understand how much time you spent on that block tower she just knocked down!” At times, it can sound “over the top” – but to help overcome Rose’s emotional distress about her new sibling, this level of support is needed. I find that there are many parallels in this parenting experience to adjustments with new team members at work. When a conflict arises with a new team member, it is easiest to think, “We just have to get through these first few months – then it will be all smooth sailing!” Indeed, though, we need to address these conflicts directly using a very similar approach: understanding the situation from the new team member’s perspective; engaging directly in a dialogue on the points of difference; and discussing constructive alternatives to the current conflict. Rose is starting to get along much better with Gabrielle (she just called her “best friend” for the first time! ), but we know that with each challenge we overcome, a new one emerges to take its place. Sure enough, now Gabrielle is now starting to initiate the conflict! The next challenge is already here. Jim works at the Janssen Spring House, PA site and supports new products in development within the Product Quality Management organization. Jim joined Janssen in the summer of 2014, after 14 years in pharmaceutical technology roles across both large and small molecule products.